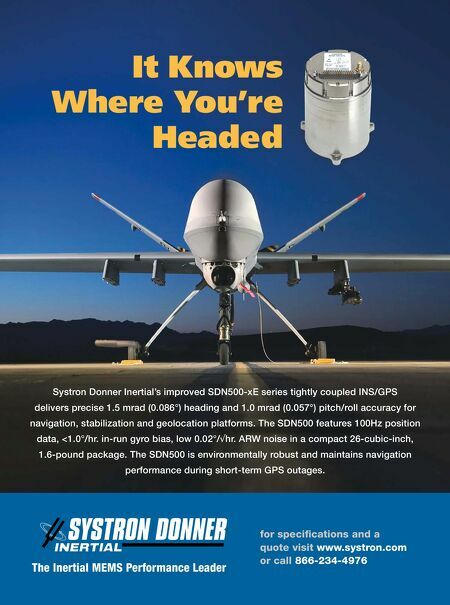 It Knows Where You're Headed The Inertial MEMS Performance Leader for specifi cations and a quote visit www.systron.com or call 866-234-4976 Systron Donner Inertial's improved SDN500-xE series tightly coupled INS/GPS delivers precise 1.5 mrad (0.086°) heading and 1.0 mrad (0.057°) pitch/roll accuracy for navigation, stabilization and geolocation platforms. The SDN500 features 100Hz position data, <1.0°/hr. in-run gyro bias, low 0.02°/3hr. ARW noise in a compact 26-cubic-inch, 1.6-pound package. The SDN500 is environmentally robust and maintains navigation performance during short-term GPS outages.